Adenosine deaminase (ADA) deficiency is an inherited disorder that damages the immune system and causes severe combined immunodeficiency (SCID). People with SCID lack virtually all immune protection from bacteria, viruses, and fungi. 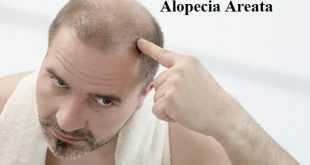 They are prone to repeat and persistent infections that can be very serious or life-threatening. These infections are often caused by “opportunistic” organisms that ordinarily do not cause illness in people with a normal immune system. A buildup of dATP in all cells, which inhibits ribonucleotide reductase and prevents DNA synthesis, so cells are unable to divide. 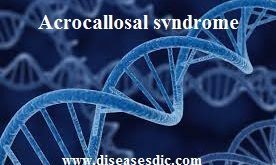 Since developing T cells and B cells are some of the most mitotically active cells, they are highly susceptible to this condition. An increase in S-adenosylhomocysteine since the enzyme adenosine deaminase is important in the purine salvage pathway; both substances are toxic to immature lymphocytes, which thus fail to mature. Because T cells undergo proliferation and development in the thymus, affected individuals typically have a small, underdeveloped thymus. As a result, the immune system is severely compromised or completely lacking. What are the Causes and Risk factors of ADA Deficiency? The major cause of ADA deficiency is by mutations in the ADA gene. This gene provides instructions for producing the enzyme adenosine deaminase. This enzyme is found throughout the body but is most active in specialized white blood cells called lymphocytes. These cells protect the body against potentially harmful invaders, such as bacteria and viruses, by making immune proteins called antibodies or by directly attacking infected cells. Lymphocytes are produced in specialized lymphoid tissues including the thymus, which is a gland located behind the breastbone, and lymph nodes, which are found throughout the body. Lymphocytes in the blood and in lymphoid tissues make up the immune system. The function of the adenosine deaminase enzyme is to eliminate a molecule called deoxyadenosine, which is generated when DNA is broken down. Adenosine deaminase converts deoxyadenosine, which can be toxic to lymphocytes, to another molecule called deoxyinosine that is not harmful. Mutations in the ADA gene reduce or eliminate the activity of adenosine deaminase and allow the buildup of deoxyadenosine to levels that are toxic to lymphocytes. Immature lymphocytes in the thymus are particularly vulnerable to a toxic buildup of deoxyadenosine. These cells die before they can mature to help fight infection. The number of lymphocytes in other lymphoid tissues is also greatly reduced. The loss of infection-fighting cells results in the signs and symptoms of SCID. If the disease doesn’t appear until later in childhood or adulthood, the symptoms may be mild at first. The first symptoms may be an ear or upper-respiratory infections that keep coming back. Diagnosis of ADA-deficiency is established by biochemical and molecular genetic testing. Biochemical testing demonstrates absent or greatly reduced ADA activity (< 1% of normal) and marked the elevation of the metabolite dATP or total dAdo nucleotides (the sum of dAMP, dADP and dATP) in erythrocytes. Reduced activity of SAH hydrolase in erythrocytes (< 5% of normal) is also characteristic. If a patient with suspected ADA- deficiency has had a recent blood transfusion, analysis of ADA activity can be measured in the parents, with reduced activity seen in heterozygous carriers, or can be performed on nonerythroid cells such as leukocytes. Fibroblasts can also be used, but fibroblast cultures are usually not readily available and this may delay diagnosis. Molecular genetic testing relies on the identification of biallelic pathogenic mutations in the ADA gene, located on chromosome 20q12-q13.11 and in which over 70 causative mutations have been identified. Diagnosis of ADA-deficiency is established by biochemical and molecular genetic testing. Bone marrow or stem cell transplants from a haploidentical donor is available for a minority of patients. Enzyme therapy can directly add missing ADA. 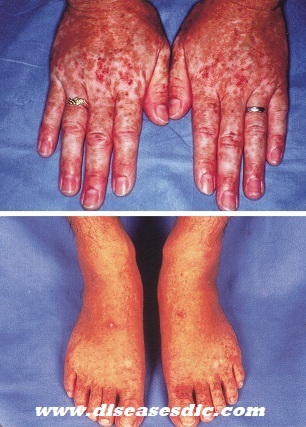 This can occur through a transfusion of irradiated red blood cells. Patients on this regime experienced equally depressed antibody responses as untreated ADA deficient patients. Direct enzyme injections are a better method of introducing ADA to the patient. 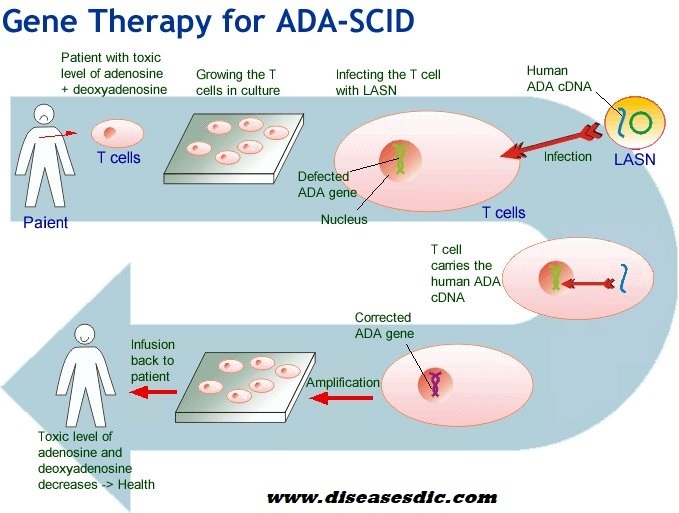 Somatic gene therapy can create functional ADA + T cells. The latest treatment for ADA deficiency is gene therapy. Gene therapy provides victims with their own T cells into which a normal copy of the human ADA gene has been inserted. ADA deficiency is the first disease to be treated with human gene therapy. The long-term outlook (prognosis) for people with adenosine deaminase deficiency (ADA deficiency) varies depending on the severity of the condition, the timing of the diagnosis, and the response to treatment. Early screening of SCID during birth could be easy to diagnose and treat the ADA deficiency which may also reduce the duration of outcomes. For babies diagnosed early and treated with a bone marrow transplant/stem cell transplant, the long-term outlook is generally good. At this time, it isn’t clear if these children will still develop developmental or behavioral problems later in life. Long term outlook can be seen in ADA deficiency patient if they have been treated with gene therapy. However, enzyme replacement therapy generally gives better results but it may lose effectiveness over many years. 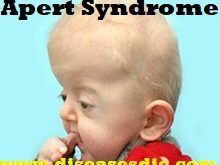 Next Cystic Hygroma or Cystic Lymphangioma – Causes and Prevention. Skin Abscess : Causes, Symptoms, and Prevention.